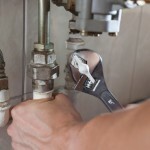 Plumbing Repair, Lakeland, FL | A Step Above Plumbing Inc. Plumbing Repair, Lakeland, FL | A Step Above Plumbing Inc.
A Step Above Plumbing opened in 2003, and our founders have extensive experience in the plumbing repair industry in Lakeland. Indoor plumbing is one of the great modern inventions that we enjoy and often take for granted. Warm water coming through your showerhead and a flushing toilet are just two of the items that rely on the pipes that connect your property to the water main or septic system. There are many pipes within the walls of your structure, so the chances of something going wrong with one of them, or one of the many fixtures that connect to those pipes, are high. When you do experience a problem in your home or office, it’s important to have a company you trust that offers extensive plumbing repair services. If you’re located in the Lakeland, Florida area, the leading company for plumbing repair services is A Step Above Plumbing. Our plumbers have experience with all types of repairs and installation jobs, so we can handle just about any issue that you encounter. If you’re having a problem with your water heater, our technicians can diagnose the issue and provide a quote for repair or replacement. We also offer pipe installation and repair, toilet installation and repair, drain repair, and much more. A Step Above Plumbing opened in 2003, and our founders have extensive experience in the plumbing repair industry. We also specialize in commercial work, so if you’re having problems at your office building, give us a call. Our plumbing repair services are some of the best in the Lakeland area, so you can trust that our technicians will solve problems quickly to minimize damage while saving you money.